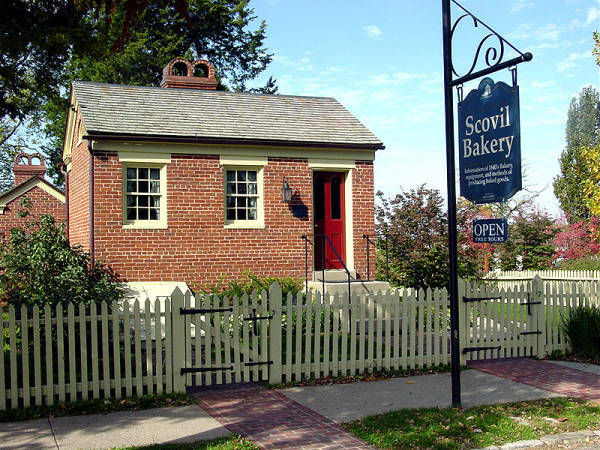 If you have ever been to Nauvoo, the chances are very good that you have visited the Scovil Bakery. The original owners were Lucius and Lucy Scovil (sometimes written as Scoville), and it is located on the west side of Main Street, south of the LDS visitor’s center. If you were lucky, the missionaries at the bakery gave you a gingerbread cookie. Lucy died a week before the group that followed Brigham Young began to abandon Nauvoo. Lucius was called to a mission in England, so instead of traveling west, he traveled east. In 1848, most of the new converts from England and Scandinavia were sailing to the port of New Orleans and then up the Mississippi to St. Louis. It became necessary for the church to have an agent in New Orleans to oversee the immigration. When Lucius returned from his mission to England, he was called to serve as the agent/branch president/missionary in New Orleans. On the 2nd of March, 1849, as I took a walk, I meditated upon my situation. I had been in New Orleans all winter in the midst of death and desolation and was in a state of despondency as the emigration had not yet commenced, and there were but few saints in the city and neighborhood and they were so poor that they had all they could do to sustain their families. My money was nearly gone. While in this mood something spoke to my understanding almost as plain as if I had heard a voice telling me to go down to Callaboo square and when I got there I turned to the right on the south side of the square where I would find an old Frenchman who kept a bookstore. I was told to go into the store and buy a lottery ticket, the number of which should be 9998, and I should get a prize. The thought thus suggested to me was as foreign to my natural feelings as anything could possibly be, yet I walked forward and 15 minutes later I found myself at the bookstore. When I entered the store I felt that I had been very familiar with the Frenchman at some previous time. I therefore inquired if he had lottery tickets for sale. He asked me who told me that he had lottery tickets for sale, as there was no lottery tickets for sale in Louisiana, it being contrary to law, “but” said he, “I have lottery tickets for sale and the drawing is tomorrow.” He then spread out the tickets before me on the counter and I soon discovered a half ticket of the number I wanted, No. 9998. I asked him the price, and he said $2.50. I took the ticket and paid for it and as I put it up I remarked that I should draw a prize on that. The expression brought a hearty laugh from the old Frenchman who said, “My good friend, do you know where to go to find out if you win a prize?” I answered in the negative. He then said: “You go to St. Charles Exchange in Magazine Street and you will find out, for the first steamer that leaves Havana after tomorrow will bring the scheme of the drawing.” He then explained that he had sold tickets for the Havana lottery for 20 years. On the 12th of March I went to the place designated and inquired for a scheme of the drawing of the Havana lottery. I obtained a copy and soon discovered my number on it…I then presented my ticket (which he said was as good as the gold of Havana) for $250.00, but there was a 7% discount on it. He gave me a draft on the bank of New Orleans for the sum of $231.23. I went and drew the cash and felt truly thankful to God for what had happened, for the Lord has promised his Elders who went forth in his name with a contrite heart that he would feed, clothe, and sustain them. On several occasions I have learned that God’s word can be relied on, or when every avenue seemed to be closed for me, the Lord would open the way whereby means would come into my hands. Lucius Scovil died in Springville, Utah, in 1889. « Biology, Destiny, and the Soul; or, What am I, Really? Definitely one to share with the missionaries! But it’ll only work in states which have a lottery–which the Church actively opposed. If it finances a mission, it can’t be gambling, right? So what do we call it? I love it. . . But I am feeling a little bit of cognitive dissonance. Hmm, the Holy Ghost can whisper the lottery numbers to us. That sweet, still small, voice! An acquaintance of mine was on a stateside mission a few years back, and he told a story of a less-active member he was working with. He challenged her to pay tithing that next Sunday, but she barely had enough to cover rent. So he promised that if she would pay her tithing, the Lord would provide. So she paid her tithing at church that Sunday, then stopped by a gas station on the way home and bought a scratch-off lottery ticket that won her an instant $1,000. I wonder if the missionary followed up with a Sabbath Day / gambling lesson? Or would that be like killing the goose that lays the golden eggs? Also, “gambling” involves risking something for the chance to gain even more. I suppose that if the Lord is really whispering lottery numbers to you, then you are no longer gambling, right? Some caution should be observed when following the promptings of strange voices, with special numbers. A guy I know was, like so many of us, was in dire straits financially, as was his family. One day on a whim he purchased a lottery ticket with numbers given to him by a friend. The friend who is now institutionalized, heard the sequence of numbers repeating on an obscure radio frequency while stationed in the South Pacific several years prior. This series of numbers happened to correspond to winning lottery number, selected by the guy I know, making him a very wealthy man. While most people consider winning the lottery a very lucky thing, yeah even a blessing, this turned out to be anything but. Shortly after winning, the guy I know ran into some of the worst luck with everything but his money. The day he is presented with his winnings, and during a news conference his grandfather dies (standing right next to him, I might add) of a heart attack. He soon decided to buy his mother a house, but the day he brought her to it she broke her ankle getting out of the Hummer, the house burned down, and both he and his mother were arrested for meeting the description of some wanted drug dealers. His investments went south, in terms of the actual companies behind them, but ominously he always came ahead financially with insurance claims etc. It seemed that his financial good fortune came at a substantial expense to those surrounding him. Eventually the guy I know was involved in commercial plane crash, again ominously, in the South Pacific, on a flight from Sydney Austrailia bound for Los Angeles. He, along with nearly fourty others, was stranded on a somewhat unknown island full of mystery and danger. Several weeks after the crash, the group had resolved themselves to the reality that they would not be immediately rescued, this partly due to some intelligence from the surviving pilot who noted that they were about a thousand miles off coures (sadly he met an untimely death just moments after the other survivors found him), therefore they began a search of the island. One of the survivors began a trek to map the island by circling the shore, encountered an island inhabitant, she herself a somewhat shipwrecked refugee, who had several undecipherable notes in her possession. After a short experience in her company, the two parted ways – mostly due to her lunacy, no doubt a product of sixteen years of social isolation – but the survivor stole some of her notes. When he returned to camp he began an attempt to intrepret the notes but the only logical date wich could be extracted was a series of recurring numbers. These numbers were the same exact numbers that the guy I know, call him hurley, used to win the lottery. The numbers were also labled on a mysterious hatch, that went straight into the ground, which was discovered deep in the island jungle. I don’t know what exactly happens next, because I haven’t finished season one on LOST yet. I do think, though, that a valid point has been made. Don’t trust mysterious voices with lottery numbers, just don’t do it. It would be curious to know whether any of the European immigrants ever made it to utah with the lottery money. Great find, Mark! You know what, in all those years I lived in Las Vegas and all the machines I walked past in the grocery stores and all the casinos I have been in for one reason or another (only one of which involved my own gambling, mind you! ), I never once heard a voice whisper that I should drop a quarter or buy a ticket. Am I just not living that close to the Spirit, or what? Hey, paraphrasing Josepth Smith, when the Lord requires something of us, no matter what it is, it’s right! And it came to pass that I was constrained by the Spirit that I should play the slots; but I said in my heart: Never at any time have I played for money. And I shrunk and would that I might not play. Nephi says . . .
…and the Spirit said unto me again: Behold the hotel hath delivered these coins into thy hands…And now, when I, Jack, had heard these words, I remembered the words of the Hotel Manager, which he spake unto me upon check in, saying that: Inasmuch as I shall play these slots, I might prosper in the land. Though statisticethly speaking odds were greater that I should become a compulsiveth gambler, and prospereth not, yeah exceedling not. Yeah, and I knew that I could not obtain exceeding wealth at my current job, and mediocre 401(K). And again, I knew that the Hotel Manager hath delivered these coins into my hands for this cause, that I might obtain coins, an hundred fold. Therefore I did obey the voice of the Hotel Manager (and did disregard the voice of good sense),and did insert a coin into the slot, and smote the slot machine with its own rod. I’m getting tired, so I’ll just finish quickly. The slot pull doesn’t yield money, so Jack takes the clothes of slot pull winner and goes the guard of the treasury. He then disguises his voice to sound like the winner to trick the guard into giving him the winnings. Instead the two of them take the winnings together and flee into the wilderness. My husband’s grandmother once traveled through Nevada with her small son. He wanted to play a slot machine at a store. She took it as a teaching opportunity to show him that gambling is evil and a waste of money–she put a nickel in. And won the jackpot. Now I know what my next PIN number is going to be.